By Ahmed Tabaqchali, CIO of Asia Frontier Capital (AFC) Iraq Fund. Any opinions expressed are those of the author, and do not necessarily reflect the views of Iraq Business News. Activity in the economy at large, and the market in particular, came to a virtual standstill at the start of the month as it coincided with last two weeks of Ramadan which ended with the Eid holiday’s in the middle of June. The start of the summer heat in earnest further contributed to the slowdown of activity. However, the intense focus on the political activity around the election results took the spotlight over the major markers of economic recovery and the banks’ leverage to it. The elections produced winners and losers who will eventually form a coalition government as reported last month, a process that should take a few weeks but could extend to a few months. Claims of fraud surfaced as in past elections, however this time there was an unusual action by parliament to force a manual recount of the whole vote and a wholesale annulment of certain types of votes (overseas, IDP’s and security forces votes). The parliament’s action was made possible by investigations that suggested that fraud was made possible by hacking the electronic readers of the ballot papers –introduced for the first time this year. The potential disruption could have resulted in a delayed government formation until early 2019. However, objections to parliament’s action were raised to the Supreme Federal Court, whose ruling on 21st June was a master class response to the conflicting political reactions following the elections. The ruling, provided a framework for a workable compromise as evidenced by its wholesale acceptance by all of Iraq’s political parties. The ruling is discussed in a recent article: in a nutshell it led to a manual recount of only of those election centres whose results were disputed, and thus should be concluded in a few weeks. The impact will likely be felt in a changed balance of power among the Kurdish parties and among some Sunni parties, but ultimately will not significantly change the balance of power of the main election winners. The process of government formation continued unabated during this period and the broad outlines of it are taking shape. However, irrespective of how the upcoming government is formed, it would need to address the issues at the heart of the 2015 protest movement that had such a profound effect on how the election was fought and its results. These would be the provision of services and reconstruction, which require much needed overdue investments in the country’s infrastructure and the reconstruction of the liberated areas, estimated at USD 88bn over five years. Prevailing negative perceptions of Iraq’s ability to fund this have not reflected the transformative effects of higher oil prices and the end of conflict on Iraq’s ability to self-fund the reconstruction of the whole country. These were discussed in detail in a recent article, the highlights of which are: By end of 2018, based on realized oil prices of 2017 and average year-to-date for 2018, Iraq is on its way to have a cumulative two-year budget surplus of USD 18.8bn instead of the initially projected cumulative deficit of USD 19.4bn. This would be equal to a stimulus of 14.5% of non-oil GDP once reconstruction projects are underway, thus further accelerating economic activity. The effects of this stimulus would be enhanced by a potential budget surplus of USD 9.3bn in 2019 or a further 6.8% stimulus to non-oil GDP. The stock market’s action in June was a continuation of the same trends discussed here over the last few months. By end of June, the market, as measured by the Rabee Securities’ RSISUSD Index, was down -3.5%, bringing its year to date performance to -0.6%. Average daily turnover was among the lowest of the last three years and most stocks, in particular the banks continued to decline. The market’s focus continues to be the effects of the shrinking FX margins on banks’ earnings brought on, paradoxically, by the increasing signs of an improvement in liquidity in the broader economy. These were brought by the steady increases in the market price of the Iraqi Dinar (IQD) versus the USD, lowering its premium over the official exchange rate to 1.2% – the lowest point in a number of years from just under 6% at the end of 2017 and 10% at the end of 2016. FX spreads are one of many sources of revenues for the higher quality banks but constitute the bulk of earnings for the lower quality banks. However, almost all banks were caught in the group’s sell-off which accelerated in recent months. However, valid as these concerns are, they fail to take into account the transformative effects of the expected budget surpluses of USD 28.5bn for 2017-2019 on the banks’ future earnings through the simulative effects the surpluses would have on economic activity. This same leverage worked in reverse during the double whammy of the ISIS conflict and the collapse in oil prices as government finances were crushed by soaring expenses and plummeting revenues. The government resorted to dramatic cuts to expenditures by cancelling capital spending and investments which, due to the centrality of its role in the economy, led to year-year declines in non-oil GDP of -3.9%, -9.6% and -8.1% for 2014, 2015 and 2016 respectively. Ultimately, the government had a cumulative deficit of around USD 41bn during this period and accumulated significant arrears to the private sector in the process. The outstanding arrears are estimated by the IMF to be at USD 3.6bn as the end of 2017. 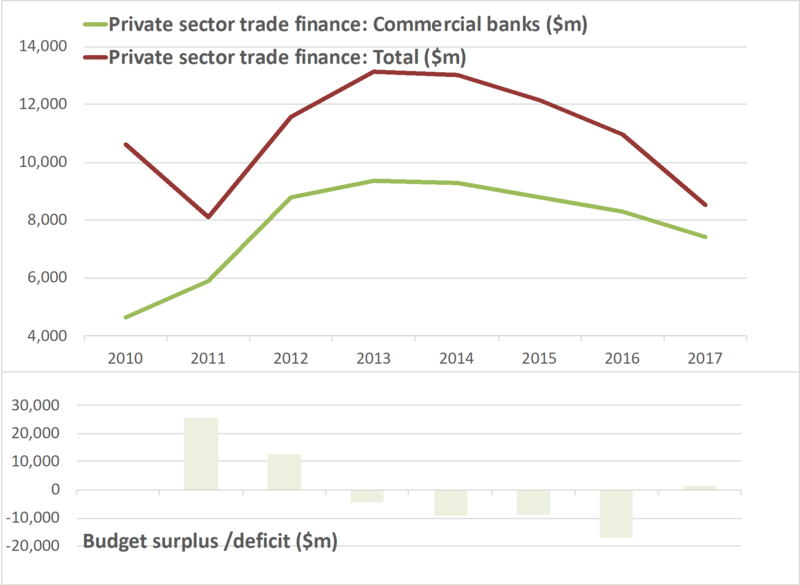 The effects were disastrous for private sector businesses at the receiving end of the cuts whose finances deteriorated, and which in turn affected the quality of bank loans as these businesses accounted for the bulk of bank lending. As a result, the banks’ earning suffered from the increasing non-performing loans (NPL’s) coupled with negative loan growth, as well as from declining/negative deposit growth. 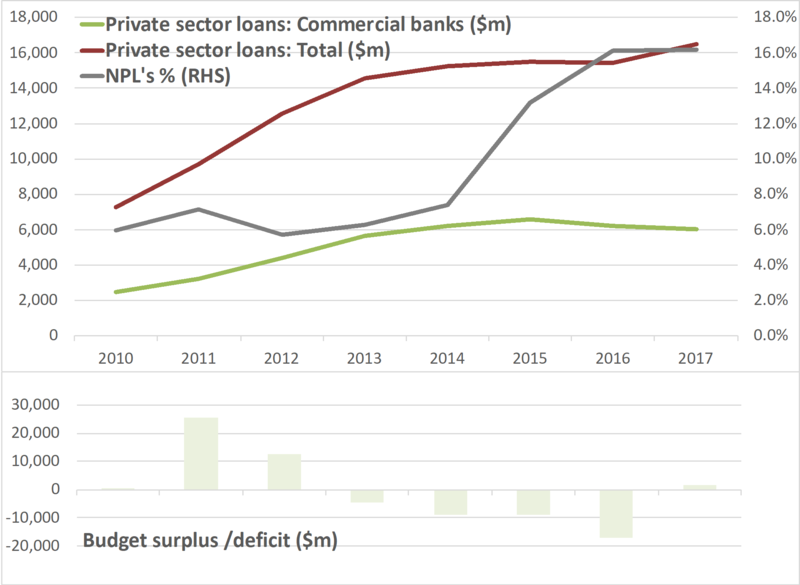 The changes for the worse for the banks during these years can be seen through the three charts below that look at loans/NPL’s, deposits and trade finance and their association with budget surpluses/deficits. The charts consider only loans/NPL’s, deposits and trade finance for the private sector but not those for the government as they are conducted through state banks. Loan growth peaked in 2015 after slowing in the prior year and has declined since, while NPL’s soared in 2015-2016 as the effects of the capital spending cuts fed through to deteriorating loan quality. These negative effects were made worse by a flight to safety as more of the private sector borrowed from state banks instead, in the process increasing their share from 59% to 63% of all private sector lending. The ultimate effects of budget surpluses and deficits on loan growth and quality can also be seen from the above chart. 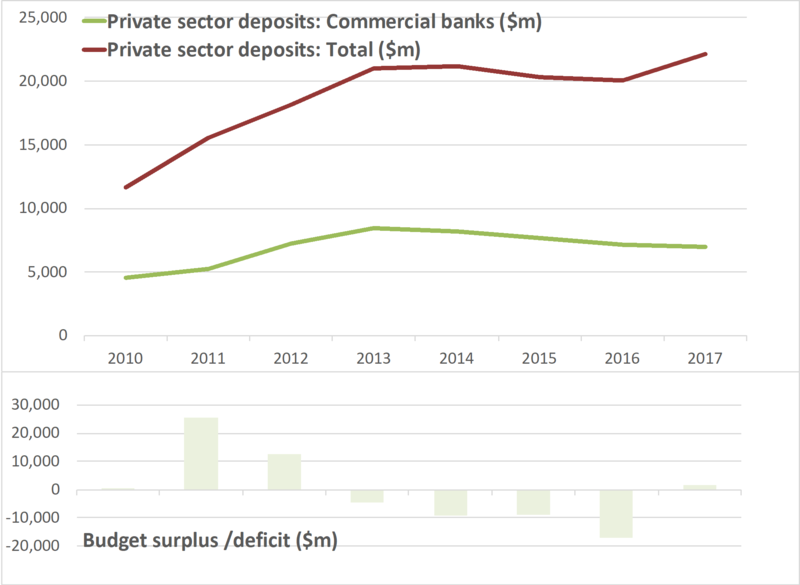 The same story is repeated with private sector deposits which for commercial banks peaked in 2013 and declined since then. The flight to quality was again evident in the slower decline in total deposit growth and its pick-up in 2017 as the expansionary effects of the recovery in oil prices and the ending of conflict were being felt. In the process, the state banks increased their share of total private sector deposits from 61% to 68%. The only area where commercial banks increased their share was that of trade finance for the private sector- increasing from 71% to 87%. However, trade finance suffered significantly in this period as trade declined due to investment cuts and the slowdown in consumer spending. This further hurt the commercial banks as it was a major source of revenues and growth. Its logical to conclude that the sea change which has taken place in the government’s financial health would reverse the trends seen in the charts above as the significant stimuluses to non-oil GDP should lead to sustainable economic activity, providing room for the banks to recover and grow again. It should be noted that these are aggregate figures for the whole sector which hide significant variations in the performance of individual banks. The pains of 2014-2017, including the recent pressure on FX margins, would have exposed the structural weaknesses of many of the banks and will likely lead to failures among the weaker ones. However, the stronger banks that weathered the storm and addressed any structural weaknesses should benefit disproportionally from the expected benefits from a recovering economy. Please click here to download Ahmed Tabaqchali’s full report in pdf format. Mr Tabaqchali (@AMTabaqchali) is the CIO of the AFC Iraq Fund, and is an experienced capital markets professional with over 25 years’ experience in US and MENA markets. He is a non-resident Fellow at the Institute of Regional and International Studies (IRIS) at the American University of Iraq-Sulaimani (AUIS). 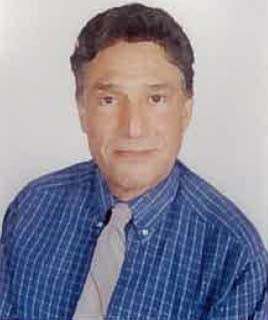 He is a board member of the Credit Bank of Iraq. His comments, opinions and analyses are personal views and are intended to be for informational purposes and general interest only and should not be construed as individual investment advice or a recommendation or solicitation to buy, sell or hold any fund or security or to adopt any investment strategy. It does not constitute legal or tax or investment advice. The information provided in this material is compiled from sources that are believed to be reliable, but no guarantee is made of its correctness, is rendered as at publication date and may change without notice and it is not intended as a complete analysis of every material fact regarding Iraq, the region, market or investment.